Available for free use to any people or groups looking to organise cooperatively. Then power on the PC with the CD loaded, at the gumnut> prompt, type 'net' to connect online, 'lan' to connect to any others on the local network and then type 'help' for a list of available commands. A text based interface provides the ability to create, reply, moderate ( agree with ) and display existing ideas over a decentralised communication network ( Gnutella ). Each proposal is a regular text file, identified by a simple naming convention that describes field attributes in the filename. Moderation weightings can be seen by searching on one or more of these fields and retrieving the individual proposals which are distributed across the network. Moderation is done by saving a local copy of each supported proposal. This aims to allow contribution of any idea, by anyone, at any time, while maintaining visibility of the commonly agreed upon ideas. The network has a decentralised topography where each proposal is a text file on the node where it was created or on another node that has mirrored it. 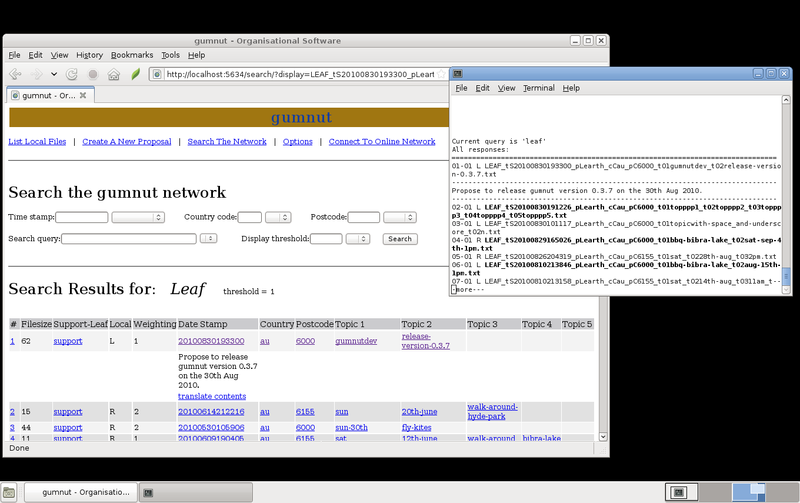 gumnut is a small feature extension of the source code from the GPL Gnutella servent named Gnut. Gnut provides the underlying network search and download features, which are then expanded upon with the addition of the ability to create a new proposal, support an existing proposal or display a list of proposals matching search terms. Mirroring is the method used to indicate support for a particular proposal. This increases the number of instances on the network and gives the proposal a higher moderation weighting when subsequently searched for. Each text file proposal follows a simple filename convention so that it can be searched for by its time of creation, geographical area of relevance and subject topics. This example leaf describes a proposal started in the year 2012 on March the 11th at 17:44.26PM. Its area of relevance/influence is planet Earth, Australia in postcode 6000. 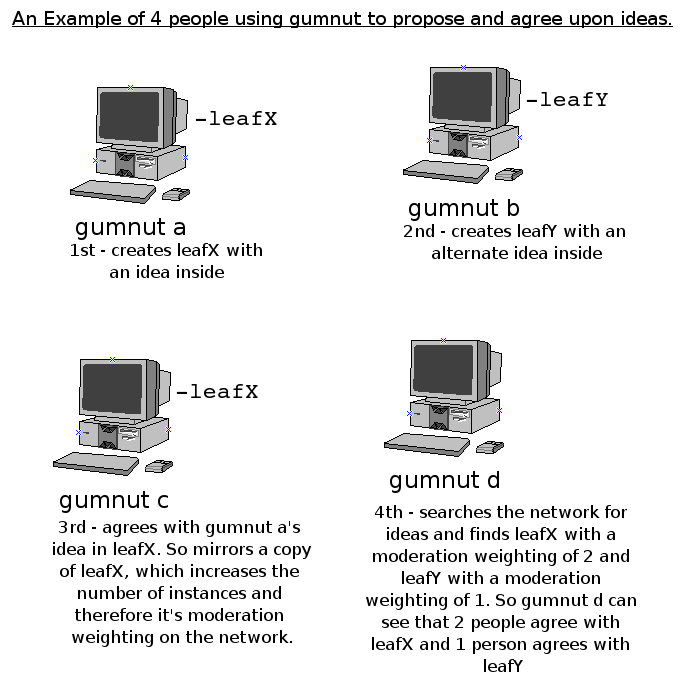 Within the gumnut development community it is a discussion about when to release the next version. - successful testing of the decision making mechanism. - successful installation on GNU/Linux and MacOS/X. In any way, from coding, patches, bug reports, testing and documentation helps progress development to a usable level for the most amount of people. - add a relevant time field to indicate the time or span that an idea is relevant to. - allow the fields in filenames to be ordered in any way. - further testing in larger groups and over the Internet. - setting up a host cache to allow easier location of the network. - documentation and this webpage upkeep. - telling people who are interested in cooperative communication about this site.